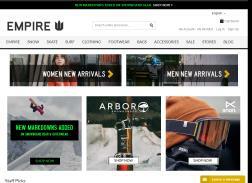 With an inventory of over 200 brands, Empire has become one of Canada's leading online retailer specializing in skateboard & snowboard related products, clothing, footwear and accessories. Get 10% off Regular priced items when you sign up with email. Valid for new subscribers only. Get free shipping on your order with no minimum purchase. Valid on Canadian shipping addresses only. Get 30% off kid’s snow pants and jackets. Get Up to 70% Off Spring Break Sale. Expires on 03/08/2015. Get Free Canadian Shipping on orders of CAD $98 or more. Cyber Monday! Save up to 40% off new selected products + Free shipping with no minimum value. Discount on The North Face are only available on selected styles. Anniversary Sale! Get Up to 50% Off your orders + Free Shipping on orders over $98 CAD. Get up to 40% Off Winter 2014 Snowboards, bindings and boots. Final Sale! Get 40% Off shoes and Free Shipping on order over CAD $98.